GAO-14-446: Published: May 30, 2014. Publicly Released: Jun 30, 2014. In its Fiscal Year 2012 Climate Change Adaptation Roadmap, the Department of Defense (DOD) identified climate change phenomena such as rising temperatures and sea levels as potentially impacting its infrastructure, and officials at sites GAO visited or contacted noted actual impacts they had observed. For example, according to DOD officials, the combination of thawing permafrost, decreasing sea ice, and rising sea levels on the Alaskan coast has increased coastal erosion at several Air Force radar early warning and communication installations. 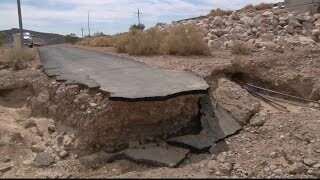 Impacts on DOD's infrastructure from this erosion have included damaged roads, seawalls, and runways. In addition, officials on a Navy installation told GAO that sea level rise and resulting storm surge are the two largest threats to their waterfront infrastructure. For instance, they are concerned about possible storm surge during work on a submarine that will be cut in half while sitting in a dry dock. Officials explained that if salt water floods the submarine's systems, it could result in severe damage. DOD has begun collecting data on historic and potential future vulnerabilities from coastal locations (installations and associated sites) and is developing regional sea-level rise scenarios for 704 coastal locations to be used following the collection of these data. However, it has not yet developed a plan or milestones for completing these tasks, including when it expects to finish data collection on a total of 7,591 locations worldwide. Without a plan, including interim milestones to gauge progress, DOD may not finish its assessments in a timely and complete manner. DOD guidance requires that both installation master planning and natural resources planning account for certain potential impacts of climate change, but the implementation of these requirements across the department varies. Installation planners said that they lack key definitions and updated guidance on construction and renovation going beyond current building codes to account for climate change. Without additional information, installation planners will be unlikely to consistently account for climate change impacts in their Master Plans and Integrated Natural Resources Management Plans. Installation officials rarely propose climate change adaptation projects because the services' processes for approving and funding military construction projects do not include climate change adaptation in the criteria used to rank potential projects. As a result, installation planners may believe that climate change adaptation projects are unlikely to successfully compete with other military construction projects for funding. Without clarification of these processes, DOD may face challenges in meeting its strategic goals and the services may miss opportunities to make their facilities more resilient to the potential impacts of climate change. According to DOD, its U.S. infrastructure is vulnerable to the potential impacts of climate change. These could affect DOD's readiness and fiscal exposure, and DOD has begun to plan for adaptation actions designed to improve infrastructure resilience. GAO was asked to assess DOD's actions to adapt its U.S. infrastructure to the challenges of climate change. This report (1) describes potential impacts identified by DOD that may affect its infrastructure; (2) evaluates DOD's efforts to conduct vulnerability assessments; (3) assesses how DOD is accounting for climate change impacts in certain planning efforts; and (4) evaluates the extent to which DOD incorporates adaptation into its infrastructure-investment efforts.GAO reviewed DOD documents on climate change, infrastructure planning, and funding processes; interviewed cognizant officials; and visited or contacted a nongeneralizable sample of 15 sites in various regions and from each military department. GAO recommends that DOD develop a plan and milestones for completing climate change vulnerability assessments of installations; provide further information to installation planners, clarifying actions that should be taken to account for climate change in planning documents; and clarify the processes used to compare military construction projects for funding, to include consideration of potential climate change impacts. DOD concurred with GAO's recommendations and explained how they will be implemented. Comments: DOD concurred with our recommendation to develop a project plan and milestones for both completing DOD's screening level vulnerability assessment and using data collected through the assessment in support of climate change adaptation planning. DOD stated that its Assessment Guidance Sub Working Group will document its current plans to complete the assessment, including a phased approach to surveying all the sites and taking steps to address analysis of data collected through these surveys. According to communication with an OSD official and our review of both OSD memoranda and briefing materials from the services: (1) in June and July of 2015, OSD directed, and the services developed, plans describing how they intend to use the data collected through the assessment in support of climate change adaptation planning and (2) from September 2014 to July 2015, OSD and the services developed milestones for completing collection of the assessment data. Recommendation: In order to provide DOD decision makers with comprehensive information on the vulnerabilities of its facilities to the potential impacts of climate change on its missions, the Secretary of Defense should direct the Senior Sustainability Officer and Climate Change Adaptation Working Group to--through the Assessment Group--develop a project plan and milestones for completing DOD's screening-level vulnerability assessment and direct the services to--in coordination with the Assessment Group--develop plans and milestones that describe how they intend to use the data collected through the assessment in support of climate change adaptation planning. Comments: In May 2014, DOD concurred with our recommendation. Since then, DOD has made progress toward implementing it. For example, the Department issued DOD Directive 4715.21, in which DOD defines climate change. Also, DOD produced a report and accompanying database, in which it provides sea level and extreme water level scenarios for 1,774 DOD sites worldwide. DOD intends the report and database to be used by its planners to adapt to sea level rise, one impact of climate change. However, as of August 2018, our review of documentation provided by DOD and discussions with department officials indicates that DOD has not yet fully implemented the recommendation. For instance, DOD had not produced information about changes in applicable building codes and design standards that account for potential climate change impacts, or full information about potential projected impacts of climate change for individual installations. Thus, the recommendation remains open. Recommendation: In order to facilitate the efforts of installation planners to efficiently implement the requirements of the Unified Facilities Criteria and DOD Instruction 4715.03, the Secretary of Defense--in conjunction with the Secretaries of the military departments--should provide further direction and information that clarifies the planning actions that should be taken to account for climate change in installation Master Plans and Integrated Natural Resource Management Plans. At a minimum, further direction could include definitions of key terms, such as the definition of "climate change" recently included in DOD Manual 4715.03; further information about changes in applicable building codes and design standards that account for potential climate change impacts; and further information about potential projected impacts of climate change for individual installations. Comments: In May 2014, DOD concurred with our recommendation. Since then, DOD has made some, limited progress toward integrating considerations of climate change into the processes of certain military services' military construction programs. For example, in 2016 briefing slides presented to congressional staff, the Army noted that two military construction projects were sited in a manner specifically designed to mitigate the impacts of climate change. However, as of August 2018, DOD had not provided us with evidence that the department's components have clarified instructions associated with the processes used to compare potential military construction projects for approval and funding. Thus, the recommendation remains open. Recommendation: In order to improve the military services' ability to make facility investment decisions in accordance with DOD's strategic direction to include climate change adaptation considerations and additionally, to demonstrate an emphasis on proposing projects with an adaption component to installation planners, the Secretary of Defense should direct the Secretaries of the military departments to clarify instructions associated with the processes used to compare potential military construction projects for approval and funding so that, at a minimum, climate change adaptation is considered as a project component that may be needed to address potential climate change impacts on infrastructure.